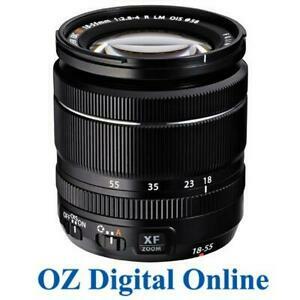 Fujifilm  FUJINON XF 18-55mm F2.8-4 R LM OIS Lens. A Super EBC coating also improves contrast and color neutrality by reducing flare and ghosting when working in strong lighting conditions. Linear Autofocus Motor. Immediate payment of AU $539.00 is required. All in all an excellent lens. I purchased this lens for use with a Fujifilm XE2. I already had a number of Fujifilm's excellent prime lenses, but needed a zoom for those occasions when you don't want to carry multiple lenses. It has proved to be a very good lens. It is well made with lots of metal in the construction, not a light weight plastic job. It feels smooth to operate and is a good looking lens. The 18-55 range is equivalent to 28-80 in 35mm and the 2.8-4.0 aperture works well in low light situations. The optical performance is what you would expect from Fujifilm - very very good. Not quite up there with the primes, but very good as a zoom. 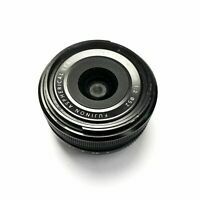 Fujifilm lens are not cheap but this one came at a competitive price. This is a great little lens with good sharp optics and quick focus. It's zoom range is moderate wide angle to moderate tele so it makes a great travel lens on my XT-1 and soon to arrive X-Pro2. I think the variable aperture is not an issue as the lens has image stabilisation. This cost of this lens and it's aforementioned features makes it a deal breaker over it's fixed f/2.8 aperture counterpart. Highly recommended.